... as in "Stick a fork in it, baby, 'cause it's done!" Yes ... I'm finished with the White Mountains. They had me worried. The descriptions I'd read and stories I'd heard were intimidating. I was by no means certain I was up to the challenge. Well, the descriptions and stories are all true. The White Mountains will have their pound of flesh. You will not get through them without some pain and suffering. And expect to take longer than ... you expect. It's not just the tough trail, it's also the physical effort of climbing so many big mountains. After hiking 15 to 20 miles per day for nearly seven months, I thought I was fit. But I needed to be more fit to get through the Whites. I needed more leg strength, more durability in knees and ankles. For gosh sakes, I needed tougher feet. My feet have never been more swollen than they are today. Yes, the Whites are a true test of the long distance hiker's fortitude. But even a stiff old 63-year-old can hike through them *twice* on the AT, entirely by day hikes (meaning at least four side-trail trips involving 3000 feet of climbing and descending and 6 to 8 miles of non-AT hiking each), and do it in 20 days. It has been a memorable twenty days. It began with that first joyous climb into the tundra at Moosilauke and ended today with a bunch of bedrock scrambling, rewarded by lots of views of more bedrock, on the slopes of Moriah. Below is the steep face of Moriah as seen from one of the many bedrock viewpoints that begin within 50 feet of the saddle where the Stony Brook Trail comes up. That little section, from Stony Brook Trail to the summit of Moriah, was the most challenging part of the walk today, though far from the steepest. There were plenty of places on sloping bedrock where you had to rely on getting traction from a little knob or curve in the rock, from a crack or just from the general roughness of the surface. I'm *so* glad today was a dry day, and *so* glad I didn't decide to hike this bit yesterday in the rain (which I had considered). 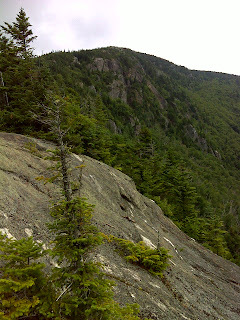 On the other side of Moriah, the AT follows the Kenduskeag trail for a bit then descends to US 2 via the Rattle River Trail. There's lots of steep trail in the upper half, but no real challenging footing issues, at least by White Mountain standards (and yes, by the time you get through the Whites, you tend to have different standards regarding what's tough and what's easy). 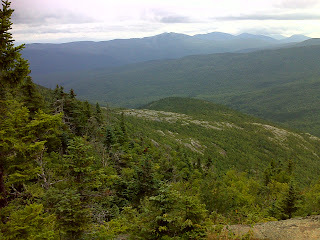 The day started out cloudy and humid, with fog obscuring views on and of the high peaks. But it steadily improved, so that I got to partake of all the available views on the way back. By the time I was back in the lowlands of the Rattle River Trail, it was a warm humid summer day. And the birdsong was missing. It happens suddenly every year, but it's inexorable: the season has changed. The birds are done nesting and fledging their young. They're no longer defending their territory. Now they're stoking up on calories for the upcoming migrations. Before long the leaves will be changing! White Mountains? Check. Mahoosucs? Bring 'em on. The Whites have SUCH a reputation. Thanks for posting the pictures with your commentary. Your blog is quite an education for me and I know it will be a great resource as I prepare for the trail. Under 1000 miles to go! A day hiker's guide to Success Pond Rd.